As one of the macronutrients, carbohydrates or carbs are responsible for giving the energy required for the body processes. It should be a crucial part of any healthy diet and should never be avoided. Carbohydrates are of different types and depending on their chemical structure, they are called as simple or complex carbs. They are processed differently in the body. As the name suggests, simple carbohydrates, also known as simple sugars, are made of one or two types of sugars. They can be categorized as monosaccharides (single sugars) that include glucose, fructose and galactose and disaccharides (double sugars) that like include sucrose, lactose and maltose. When three or more sugars are linked together, they form complex carbohydrates like starches or fibers. Fiber is not digested in the body as compared to starch and has various health benefits. Simple sugars usually contain refined sugars and very little vitamins or minerals. They are easy to break down and get digested in the body. Complex carbohydrates contain vitamins, minerals and fiber and require long time to get digested. The resources of simple and complex carbohydrates are different and depending on which foods you choose, it becomes essential for your health. You get simple carbs from foods like candies, soda, high fructose corn syrup and sweetened breakfast cereal. Some of these simple carbs are added to foods, while some are naturally present in foods like milk. Since the foods mentioned above do not contain much or any micronutrients, phytochemicals, vitamins or minerals, they are referred to as empty sugars as well. For this reason it is better to avoid foods like soda, juice, cookies and pies. Examples of complex carbohydrates containing starch are baked and sweet potatoes, brown rice and pasta, whole grains and oatmeal. Foods containing fiber are broccoli, spinach, asparagus, cauliflower, onions, mushrooms, pepper, as well as dark green leafy vegetables. 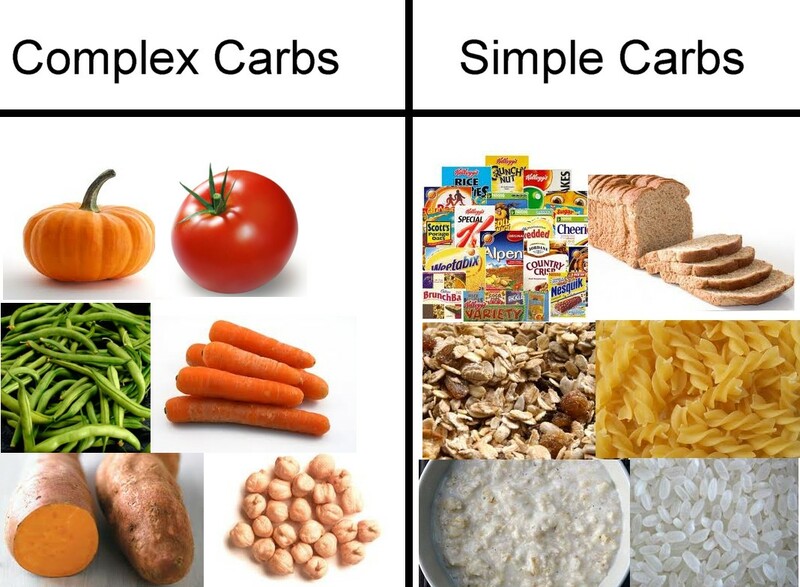 Now that we have understood "What is the difference between simple and complex carbohydrates?" we will look at how we should go about making the right choice. When you have the option to choose, it is better to opt for complex carbohydrates more than simple carbohydrates because the former contains more nutrition. For this, you should choose foods like whole grains, legumes and vegetables which will ensure that you have steady supply of energy, gradual rise in blood sugar levels, besides taking various other nutrients. It is good to pick up the complex carbohydrates which are not processed or simply check the ingredient list when shopping. The foods that you pick up should not have words like processed, refined, bleached or enriched. Such foods do not contribute much nutrient value to your diet and are quite deficient in energizing the body. Since you have known the answers to "What is the difference between simple and complex carbohydrates" and "How to choose it wisely", it is also important to know the recommended amount of it every day. The recommended daily intake of carbohydrates ranges from 45 to 65 percent of total caloric intake, which is roughly around 225 to 325 grams of carbs from a 2000 calorie diet. This amount is inclusive of 28 grams of fiber which is a complex carbohydrate. You can click HERE to calculate recommended intake for you based on your gender, weight, activity level, etc. Fiber helps in digestion as well as lowering the risk of type 2 diabetes and coronary heart disease. Everyone should ensure that their intake of carbohydrate does not go below 130 grams, as this is the minimum intake essential for the basic requirements of the body. After knowing "What is the difference between simple and complex carbohydrates?" it is easier to make the choice and keep it a healthy mix of both. What Can Gelatin Be Made Of? Are Plums Good for You?